God Works Through Mission Centered Koinina, Conversations And Prayer. Recently a group of believers, from different churches and backgrounds, gathered to pray for a Christian mission at a local church. They worshipped with the congregation, had some deep spiritual fellowship, heard the latest presentation, discussed some details about the mission and most importantly, prayed together. 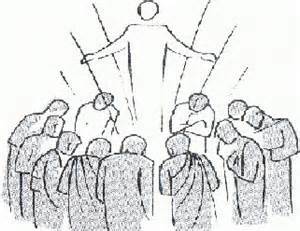 Through these meetings, I could discover the truth that where two or three, (or more) gather in the name of Jesus, then Jesus is right there with them to hear prayer and give direction to the church. This report reflects on Jesus teaching in Matthew 18:19-20. It will later apply this teaching to the gathering that recently occurred. There will be a very brief overview of some main points. May God bless your groups prayers that help propel the Gospel to the ends of the earth. From Matthew 18, we discover that if two or three believers pray together, Jesus answers. Why is this? The church is the visible presence of God on earth. God works through the local church. The church is Jesus’ dwelling place. Where Jesus is, there is the church. Therefore, the actions of the church must reflect the mind and heart of God. The decisions of the church are guided from heaven through prayer. Jesus’ guidance is given to the collective body of diverse leaders who pray for it. The number of members who gather to pray is not important. The motive and purpose of gathering is important. The motive must be to let the glory of God shine throughout the earth and see his Kingdom grow and expand in the hearts of people. In short…to make Jesus known. The Bible teaches us that when just two or three worship Jesus and pray, Jesus is present. When Jesus is present, a few people can be used to bring about change. Christian faith can spread through such praying believers. This church was very cosmopolitan, made up of people from different countries and backgrounds. Barnabas was a Levite from Cyprus who had been a pillar of the Jerusalem church. He knew how to see the work of God in others and embrace them. Simeon was called “Niger”. Niger is a country and a river in Africa. Perhaps he was from Africa. Lucius of Cyrene may have been Greek. His Latin name indicates Roman influence. Manaen had been brought up with Herod the tetrarch. He must have been a privileged person living in the royal court. Saul had been a Pharisee in Tarsus. This diverse group prayed and worked in one spirit to build up the local church. They were seeking to magnify the name of Jesus to the nations and expand the territory of the Kingdom of God. God blessed the diversity of the leadership in the Antioch church. Through their conversations, fellowship and prayers they could find the will of God for their ministry. If one senior member wanted things the old way, because that is they way it has always been done, a younger elder could give a little “pushback” and show that God could be leading the church in novel new ways, like sending missionaries to the Gentiles. If a traditionalist wanted to integrate Jewish laws into the mix saying they are necessary for salvation. Such people would want to send out missionaries who were more predisposed to the teachings of the Judaizers. The Gentile converts could give some “pushback” and make sure faith was elevated above all things and propagated by the new missionaries like Paul and Barnabas. If some wanted to change things too quickly, sending out more than Paul and Barnabas, another could speak up to get the church to slow down and follow God’s leading. If some wanted to hold onto Barnabas and Paul, thinking that keeping them was necessary for the survival of the fledgling church, another could stand up and boldly declare what the Spirit wanted, that is, to send Barnabas and Paul out. You can see how diversity blesses those who gather to pray to Jesus. Diversity is needed among elders…diversity across cultures, across generations, across professions. Diversity allows for some humble, positive pushback and discussion as they prayed. This is what the Antioch church had and they were blessed by God. Jesus was with the Antioch elders, as he promised. He communicated his desire to set Paul and Barnabas apart for world mission. Look at verse 2b, “…the Holy Spirit said, “Set apart for me Barnabas and Saul for the work to which I have called them.” Jesus is alive. The living God was present among them and communicating to their hearts. It was because they were united in their faith, their love for Jesus, and their desire for the Gospel to be made known. They were open to accept what the Spirit had to say to them, even if it meant a small, young church being called to send their best leaders as missionaries. If they were insisting on their own vision, their own plans and their own goals, even though they were gathered to pray, and even if Jesus was with them, it would be questionable as to whether Jesus would answer their prayers. If they were rubber stamping one elder’s opinion or if they were afraid to speak up to counter one person’s opinion, then I don’t believe Jesus would communicate. Those gathered to pray in Jesus’ name needed to be humble and respectful and yielded to Jesus who dwells among them. Part 2: Jesus’ Teaching Applies Today Too. We recently experienced the power of prayer, when a small group of diverse believers come together to pray. At the formal meetings there were five believers, of very diverse backgrounds, gathering together in Jesus’ name to pray. We are not all elders. But we are all committed to Christ’s mission. Like the elders in Antioch, there was a time of fellowship and discussion and prayer. They stayed in two elders homes. They worshipped with us. They ate with us. They took time to listen to the presentation. They sought understanding. One thing I was taken back by was their respect for the young missionaries. Three of us are in our late 40’s -50’s. One was 70. But they respected the younger missionaries and their opinion and responded to their opinions, even though the missionaries are in their 20’s. They were making important decisions according to the input given by the young missionaries. To me, that’s humility. The talks were very thorough. The amount of information was vast, but with God’s help, an understanding and a consensus was reached and we prayed together. There was much rejoicing over the amazing providence of God and how quickly God was moving this mission forward. I appreciate the diversity, the humility and respect I found among praying believers. I was an observer, but I was able to give some input and voice my opinion on certain matters. They were welcome and I truly appreciate that. I was amazed at what was accomplished. You wouldn’t think that sitting around for eight hours in one day and talking, will accomplish much, but it does. This world is run by people who are willing to sit behind and closed door meetings and attempt to wrap their minds and their hearts around the “big topics”, contribute to the conversation and pray. One student stated that they are worried about studying English literature and religion, thinking that other degrees will be more successful. But it is all about the ability to engage in the larger conversations with others. I am an unlikely candidate to participate in such meetings. It is not easy for me to stay focused, especially when money matters are discussed. I feel like a flipped over, bloated sheep. But I am glad that God raises up others to embrace these topics and helping me to be there. Finally, it is true, Jesus is among two or three or five or more Christians, from diverse backgournds, come together to pray. He was truly with us. The meetings were smooth. There was peaceful, joyful consensus. There was Christian Koinina. The mission was advanced a little more because Jesus was with us, hearing prayers, giving direction and blessing.